These new poems, written between 1994 and 2005, cover the period of Nicholas Hagger’s tenure of Otley Hall in Suffolk and his growing interest in Elizabethan and Tudor themes. Many of the poems in this volume celebrate English history on the eve of and at the start of a new century. They locate specific places in the context of a single, evolving cultural tradition. The image of the knot is taken from the Knot Garden at Otley Hall (replicated at his new home), which is a symbol of the One. What does it mean to be English in the 21st century? ‘A Tudor Knot’ focuses on the traditional view of little or “middle” England. ‘In Europe’s Ruins’ widens the perspective to focus on Europe and the ancient European civilizations of Greece, Rome and the Renaissance which shaped Britain. ‘A Global Sway’ widens the perspective further to include our globalist identity in poems set outside Britain and Europe. ‘The Western Universe’ defines our identity in terms of the universe and the One in poems set in everyday situations around Epping Forest, where the poet grew up and now lives. These poems address the split in the British soul between Eurosceptic love of England and Europhile love of the European origins of the Celts, Romans, Saxons, Jutes, Normans who now make up the English race. The “Classical Ode” form is 8- or 10-line stanzas, rhyming ababcdcd(ee), or more often abcbdefe(gg). Drawing on the concept of the “classics” (Greek, Roman and traditional English literature) and “classicism” (which is equated with order, beauty, reason and tradition, clarity, restraint and serenity), Nicholas Hagger has redefined the Ode as a reflective, philosophical and descriptive poem, rooted in places/a social situation, which is dignified and exalted in subject, feeling and style. In Nicholas Hagger’s hands, the Ode is able to reflect the conflict – and underlying harmony – of our Age: the decline of the monarchy, the British political system, the Church – the traditional Establishment – and of Britain’s world role and the quality of increasingly squalid contemporary life, which is contrasted with the dignity and order of the glorious classical/Tudor past. The last poet to write four books of Odes was the Roman/Latin poet Horace, who also reflected his Age in everyday verses. 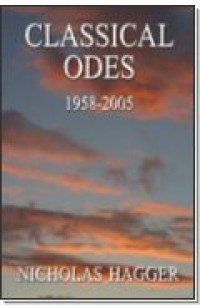 In Classical Odes Nicholas Hagger achieves a blend of poetry and history, of the traditions of Herodotus and Pausanias (both of whom visited classical sites) and of Virgil and Horace (who wrote of everyday life in the countryside). In the first four-book Odes since Horace, published here for the first time, he addresses the concerns regarding Western civilisation of Pound, Eliot and Yeats – particularly, the concern Eliot had about the impact of Europe on the man of letters – and finds a new way of carrying them forward. He catches the mood of our time: dismay at the end of the Great Britain of Churchill and Montgomery, elegiac feeling that Englishness is being superseded by Europeanness and globalism, and Britain’s hesitant fumblings for a new identity in a time of transition. Never before has Western civilization’s cultural legacy been captured in verse that has such contemporary relevance. Hagger’s poems present his quest for Reality and the vision of unity, and reflect the follies and vices of the Age. He brings a new approach to the ode in this work by conveying the culture of Europe through its main sites, and by catching the transition from nation-state to European and global identities.